UO chemistry professor Geraldine Richmond was recently named the recipient of the 2014 Pittsburgh Spectroscopy Award for her significant contributions in the field of applied spectroscopy. The award is handed out by the non-profit educational corporation Spectroscopy Society of Pittsburgh (SSP). Congratulate Geri Richmond on her award. Richmond serves as the UO’s presidential chair in science. In 2012, she was appointed to the National Science Board by President Obama. Her research explores molecular interactions along complex surfaces and interfaces. Her team is involved in several research projects investigating the physical and chemical reactions that occur between molecules interacting on or across boundaries between substances—and in particular, the interactions that occur along boundaries between water and other liquids and gases. The research has broad implications for important problems in energy production, environmental remediation and atmospheric chemistry. 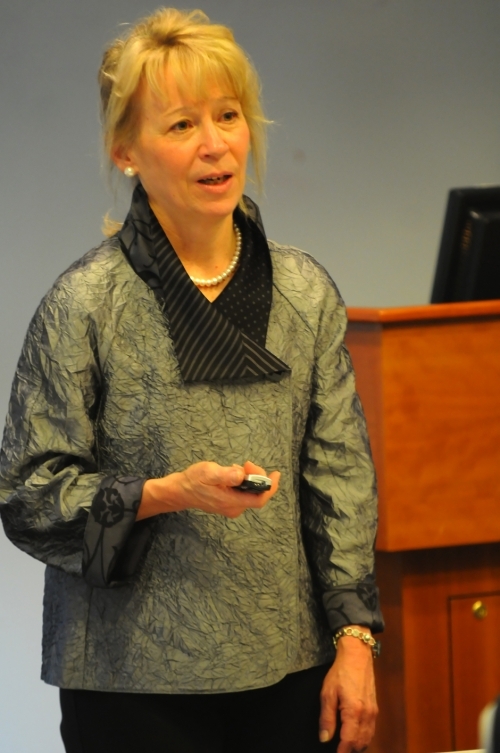 Last May, Richmond delivered the UO's Presidential Research Lecture. In addition to her work in the field of chemistry and applied spectroscopy, Richmond founded the Committee on the Advancement of Woman Chemists (COACh), an organization now broadly assisting in the advancement of women faculty in the sciences. More than 6,000 science faculty, students, postdocs and administrators have benefitted from professional training and networking workshops developed by COACh. Before joining the faculty of the UO in 1985, Richmond was professor of chemistry at Bryn Mawr College. She received a bachelor’s degree from Kansas State University and her doctorate from the University of California at Berkeley.